Who doesn’t love the beauty of oak? Yes, oak has a very strong grain that requires extra attention to fully cover with paint, but the actual topography of the wood will not be changed by adding paint. Think about the last time you painted a wall and missed one of the old nail holes – the paint doesn’t fill in holes or repair things. One of the best photos I found on the web belongs to DIY superstar Carrie who painted her own kitchen cabinets about the same time I was starting my own cabinet painting business. Carrie’s painted cabinets are beautiful AND you can still see the grain. Those two things are not mutually exclusive. Can’t you fill the grain? If you do a quick Google search on how to fill the grain on oak cabinets, you’ll find lots of solutions – many of them look brilliant when they’re done. Most no longer show any grain at all – you can’t even tell they’re oak cabinets! Each solution is very labor intensive and time consuming. Remember that when you read the details of how others are doing it at home, they have virtually limitless time – because it’s their house. They can afford to test and tweak as they go. The hard fact is that most times it will be more cost-effective to just buy new cabinet doors than to have us smooth out your old oak doors. It would double the cost of most jobs. If you have any type of “fancy” profile on the door, then it’s almost impossible to also fill those voids. So I shouldn’t paint my oak cabinets? You should paint your cabinets, but you should be aware that they will end up looking like Carrie’s photo above. Oak makes for a strong and beautiful cabinet, and they can be even more beautiful if they are professionally painted to look bright and modern. What they won’t ever be, is perfectly smooth MDF. 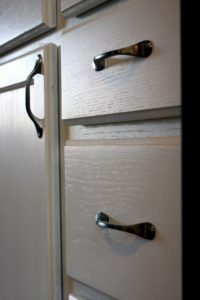 You can see lots of oak cabinets that we’ve painted in our Portfolio section. Find out how much it would cost to have your oak cabinet painted professionally.